Alison’s primary concern was the look of her smile. While discussing a cosmetic plan to give her a more beautiful smile, we discovered her teeth had worn down to the point her bite was over-closing. This unnatural bite and jaw position caused her pressure and pain in the temporomandibular joint, but also shortened the lower part of her face. This was aging her appearance. In addition to aesthetics, neuromuscular dentistry restores the bite and jaw to its most natural and comfortable position. Alison’s smile has been beautifully enhanced, her chronic pain alleviated and her youthful appearance restored. Upon completing her treatment Alison now sees us every six months for hygiene care. Full mouth reconstruction addresses every tooth to restore a natural, healthy, and functioning bite (occlusion). Occasionally one arch can be restored to create the desired result. BENEFITS: Ideal function is always the goal at Incredible Smiles. Improved function is our most important objective when we recommend and perform neuromuscular services. Symptoms like tinnitus (ringing in the ears), tingling fingers, back pain, headaches, and migraines can be relieved with neuromuscular dentistry. Old dentistry and damaged teeth can be ideally restored to a beautiful smile. TIME FRAME: Seven to ten visits typically over a four to six month period. The goal of temporomandibular joint (TMJ) treatment with neuromuscular dentistry is to alleviate tension and pain in the joint by restoring ideal occlusion or bite. 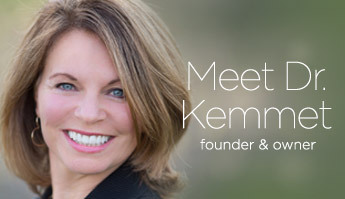 As a TMJ specialist and a Boulder dentist, Dr. Lori Kemmet, was the first female cosmetic dentist in the nation presented with the mastership award from The Las Vegas Institute of Advanced Dental Studies (LVI)* in 2004. She was the first of two practicing cosmetic dentists to hold a mastership in neuromuscular and cosmetic dentistry. As of 2010 only 12 dentists have earned this award. Dr. Kemmet offers Denver TMJ Treatment, Colorado TMJ Treatment, in addition to surrounding states, as so many of her clients travel from out of state for her care. A night guard alleviates the majority of TMJ pain. The night guard (or orthotic) can be worn only at night, however in some instances our guests receive so much relief they prefer to wear it during the daytime as well. This oral appliance can be fitted by simply taking impressions and having our lab create your custom fitting appliance. As a TMJ Denver dentist, Dr. Lori Kemmet, has helped many people relieve their TMJ problems with neuromuscular orthotics. This can be a removable or a fixed appliance. As a TMJ dentist, Dr. Kemmet, has found that the fixed appliance has better results because is has 100% compliance. If you experience TMJ pain or TMJ symptoms come see us as your neuromuscular dentist. Our results speak for themselves. Please see our video regarding treatment for TMJ symptoms. As a TMJ Denver dentist and TMJ Boulder dentist, Dr. Kemmet, trains other dentists in the art and science of full mouth reconstruction. Rest assured her training and extensive experience puts you in capable hands! TMJ treatment wtih full mouth reconstruction is a wonderful way to treat TMJ symptoms without the use of a removable or fixed orthotic. With full mouth reconstruction every tooth is restored with porcelain. This technique allows Dr. Kemmet the ability to restore the ideal length and positioning of your teeth. When length and positioning is optimal the muslces are relaxed and TMJ sympoms are reduced and occasionally fully alleviated. Full mouth reconstruction is ideally suited for anyone with old fillings and dentistry. Ask for a complimentary consultation for full mouth reconstruction. Schedule a Complimentary Consultation Today!